A month into my new job, I traveled to Alexandria, VA to work in the main office of my company for a week. It marks the first time in a nearly-20-year web development career when I traveled for business. Of course, I had to spend time checking out the record stores in the area. Most of the shops in Washington, DC are concentrated on U Street, which allowed me to hit a number of them in a single evening. I left work at around 5 p.m. on a Tuesday and crammed as much shopping as I could before the stores closed at 7 p.m. My visit to Crooked Beats happened the day before. Crooked Beat was the only shop not in DC proper, but in Alexandria itself, which made it my first destination. The DC area doesn’t have a square-footage behemoth like Amoeba, Waterloo or Everyday Music. So the shops are about equal in terms of size. That said, Crooked Beat has a slightly bigger space than the rest of the places I visited, and it allowed me to find a good cross section of releases — some Nonesuch titles, Chris Isaak’s second album and a requisite helping of Fugazi. I probably would have spent more time exploring if I hadn’t showed up about 45 minutes before the store closed. Joint Custody is comparable to Crooked Beat in terms of stock. Everything is organized by genre, and little else, so a lot of digging is required. I came away with an impulsive purchase of Kanye West — I don’t care for his politics, but The College Dropout stands above all that — and the self-titled Minor Threat compilation. If time weren’t an issue, I probably would have explored further down the racks. Joint Custody’s space is longer than it is wide, and the back portion of the store included jackets and vintage turntables. The Smiths’ The Queen Is Dead was playing in the background, which enhanced my shopping experience nicely. On the week I visited Alexandria, high temperatures reached the low- to mid-90s. And it was a humid heat. Som Records is located in the basement of a building with little in the way of signage. On any other day, the cramped, un-air-conditioned space would be punk-rock charming. Not so much during a heat wave. Despite the size, the stock in the store also spanned a wide swath of styles, and I even found another Nonesuch title from the mid-80s. 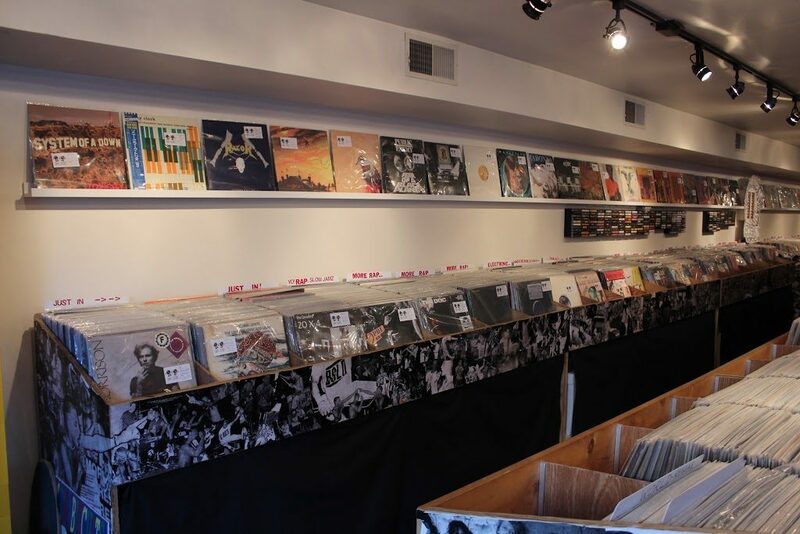 Smash Records is the punk-centric shop of the city. Getting there was a bit more of a hike, taking me away from U Street and into the Adams Morgan neighborhood. I saved it for my last destination because it closed at 9 p.m. From the hillside, you can see the Washington Monument. Like Joint Custody, Smash Records has vintage wear as well as records in a space of similar size. The stock of new vinyl focuses mostly on punk, but its used selection has a diverse range of genres. I rounded out my Fugazi collection with a purchase of Steady Diet of Nothing on CD. I nearly came away with Queen Latifah’s All Hail the Queen on vinyl, but it was in a sad state, priced accordingly. Red Onion Records is a smaller space than Crooked Beats, which meant that the available stock didn’t happen to have anything in which I was interested. So my stay wasn’t long enough to form an impression.